He’s a former coal lobbyist plagued by conflicts of interest, and he’s been ramping up a relentless attack on public health and environmental safeguards. 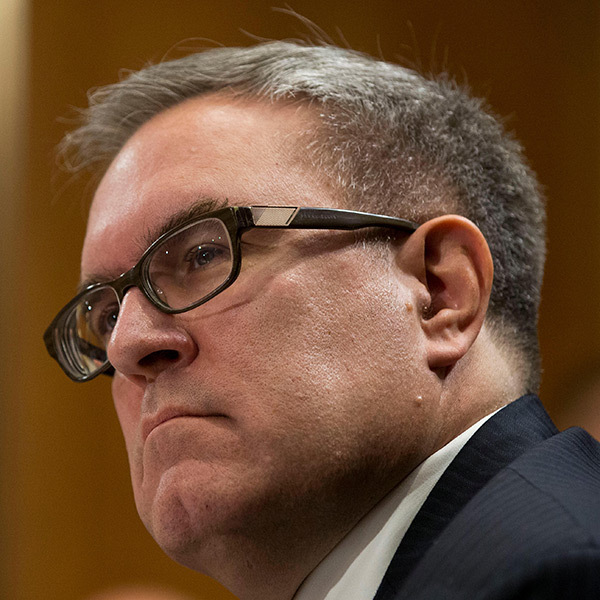 Andrew Wheeler — who became the EPA's administrator Feb. 28, 2019, after serving as acting head for eight months — is leading efforts that risk thousands of additional early deaths and hundreds of thousands of additional asthma attacks every year. Finalized in 2011, these safeguards reduce hazardous pollutants from coal-fired power plants – saving up to 11,000 lives a year. Wheeler is proposing to undermine these standards. Wheeler is proposing a dramatic weakening of these win-win standards, which would lead to billions of tons more climate pollution and cost the average U.S. family hundreds of dollars in higher gas bills. The Clean Power Plan established America’s first limits on carbon pollution from power plants. Wheeler is proposing to replace this policy with a program that would increase pollution from the power sector, which would result in more early deaths. Methane is a highly potent greenhouse gas that also worsens local smog conditions. Wheeler is proposing to weaken national standards, a step that would increase methane pollution from new and modified oil and gas facilities by more than 40 percent [PDF]. In 2016, Congress passed a bipartisan law strengthening protections against toxic chemicals. Wheeler has continued his predecessor’s efforts to weaken and limit this new law – failing to implement transparency requirements, allowing the EPA to ignore known exposures to dangerous chemicals when evaluating their risks, and weakening review of new chemicals before they can be sold. Wheeler's predecessor committed to finalize a ban on paint strippers containing methylene-chloride that are used by workers and consumers nationwide and are tied to a long record of death from acute exposure. Yet Wheeler so far has failed to finalize the ban – and has signaled that any ban would exclude workers. Wheeler’s record shows he is hostile to the EPA’s mission. The real-world result will be more asthma attacks, more health problems and more pollution.